All photos on this page are by Darcy Beck. July 20 2006. 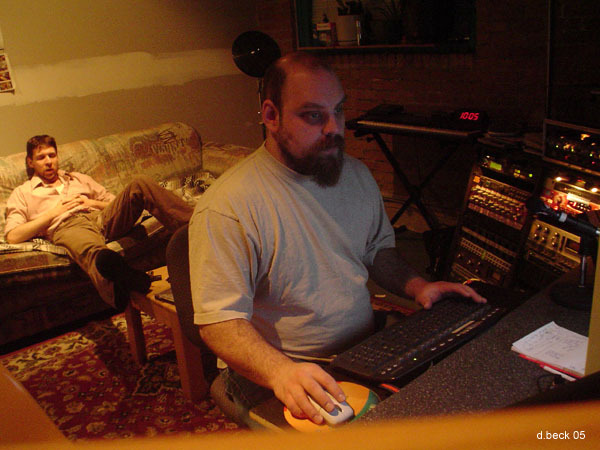 Okay, so in October 2004 Andrew, Olin, and I went into Darcy Beck’s studio in Saskatoon to record a five-song demo. 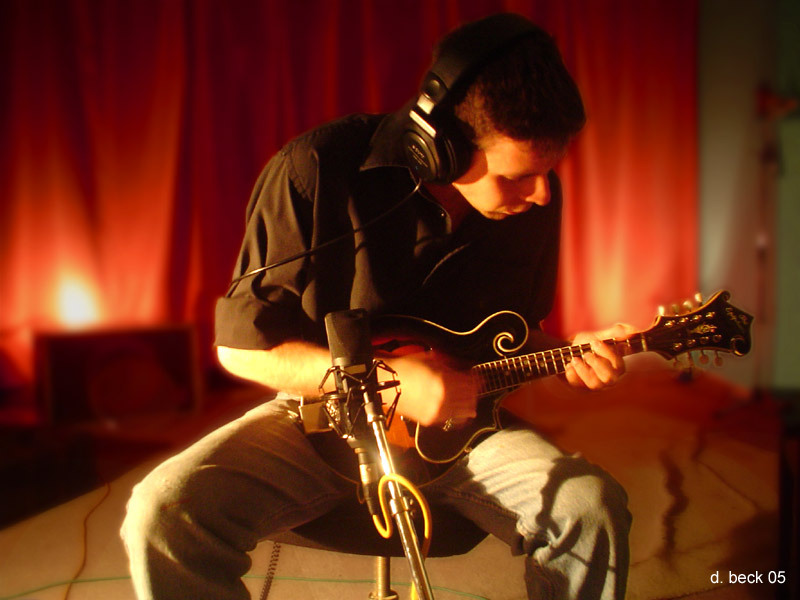 Acoustic guitars and bass, no percussion. The songs turned out pretty well. Nevertheless, immediately upon hearing them Olin left town and spent the next year working as a surveyor in the southern United States. A few months later, Andrew & I went back into Darcy’s studio to record another acoustic demo as a Christmas gift for my father. This CD included “The Band Known As Sea Water Bliss” and “The Growl Hole”, both based on stories my dad came up with when I was a kid. These demos turned out pretty well, too. We realised we were getting close to having enough songs to release together as an album. Now, at this time our drummer Dean was living in Calgary, a seven-hour drive away, with his Scottish girlfriend Anne. But they were already getting sick of all that sunshine and oil wealth, and making plans to return to the perpetual gloom of Scotland. We figured before he left Dean should get in on all this recordin’ action, so we cajoled him into driving out to Saskatoon and laying down some drum tracks. We figured we’d just get him to drum along to the demos that Andrew & Olin & I had already recorded. We probably should’ve just said, “Hey, these demos turned out pretty good. Now let’s record a real album.” Instead, we tried to add percussion and other instrumentation to the demos, which had been recorded on the fly and with scant attention paid to little matters like keeping a consistent tempo. Dean, after much frustration, was able to lay down fairly satisfactory drumbeats to the seven songs, and for good measure before he left we recorded a few more. Then Dean got on a plane and, like many a sentimental and artistic-minded young man before him, fled the New World for the Old. They have Tim Hortons in Scotland…right? 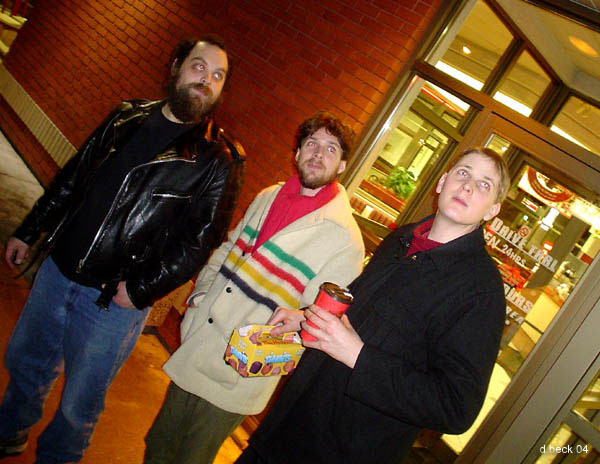 So now it was early 2005 and Andrew and I were left alone in Saskatoon with Darcy and his hard drive full of half-finished songs. And slowly, ever so slowly, with much wasted effort and the barest discernible forward motion, we crept toward completion of our album. Now, the great thing about the modern recording process is that, if you’re willing to put enough time into editing and mixing, you hardly need to put any time into recording at all. In my experience, the ratio of computer trickery to actual musical performance is something like 10:1. For example, while we were working on the song “My Evil Child”, Darcy expressed dissatisfaction with Dean’s kick drum sound. He thought some of the kicks sounded sorta wimpy. Now, if Dean had actually been present in Saskatoon we might have dragged him back into the recording booth and told him to do it again and kick that kick drum like a man. But Dean was already in Scotland, so we had little choice but to let Darcy work his magic, which involved digitally substituting every kick drum beat in “My Evil Child” with a meatier kick sound he’d borrowed from elsewhere in the song. I joked that we really only needed Dean in the studio long enough to hit each drum once, and the rest of his performance could be pieced together on the computer. Everything costs twice as much, takes twice as long, and sounds half as good as you expect. But in the end, the songs come together, and they all sound reasonably good. Of course, you’ll always wonder, if we’d spent another couple days in the studio, would it have sounded that much better? Could we have smoothed out the jagged rhythms, sharpened up the flat vocals, trimmed the shapeless guitar solos? How much more time could we have spent, and how much better would it have sounded? Ultimately, you never really know. Unlike the painter who lifts his brush from the canvas with a conviction that the painting is finished, you walk away from the studio only because you’re out of time, or out of money, or out of patience. And you hope that, as you listen to the album over the following months and years, all the glaring flaws that mar the recordings will recede to the background, and the essential quality of the songs will shine out. That’s what you hope. Anyhow, our mistake was that we recorded the original tracks in a rush and with little consideration for how they were eventually to be used. But we’ve learned from the experience. 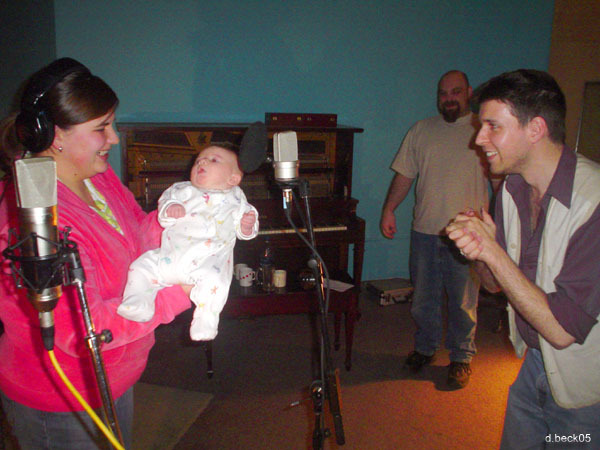 In early 2006 I went into the studio again and in just eight hours I recorded an entire song for my dad’s 60th birthday, Half My Age. It went remarkably smoothly. So when we get around to recording our second album – if we ever do – it will cost half as much, take half as long, and sound twice as good. Right? 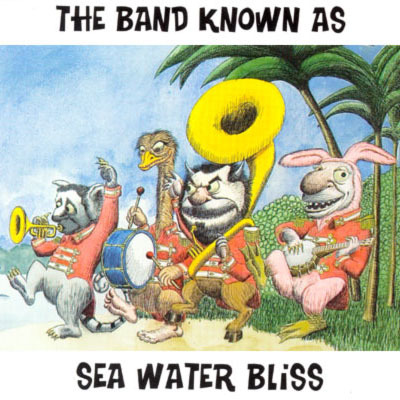 Buy The Band Known As Sea Water Bliss on CDBaby.